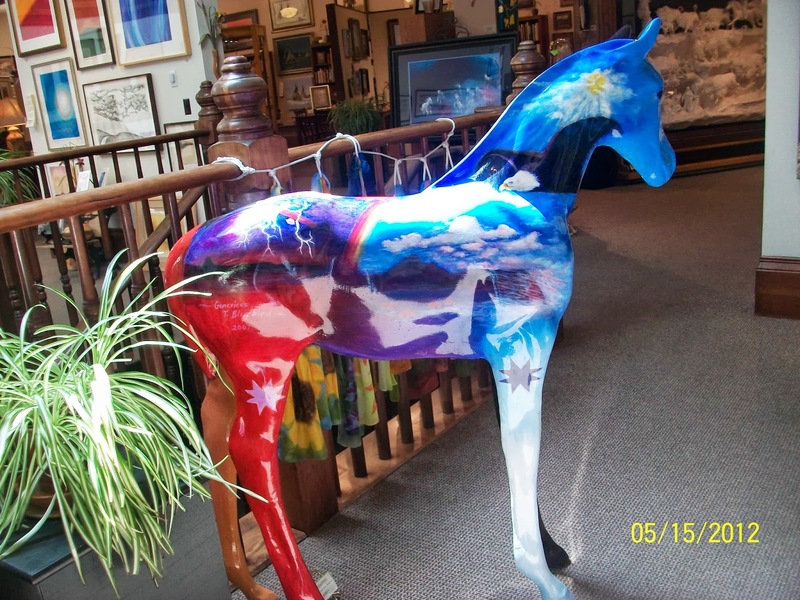 Rapid City ended up being a plethora of fun and exciting things for families to see and do. We started at the RV Park office to get another map, no matter how careful I am with local maps; I always lose the first one. You would think in only 32 x 8 feet of space that it would be easier to keep up with things and know where everything is, I have yet to get me and the others in the family trained in the habit of putting everything back in its place when done with it. The host at the office gave us a list of fun things to see/do in their home city. 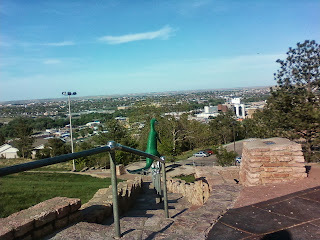 The first stop on our list was Dinosaur Park. 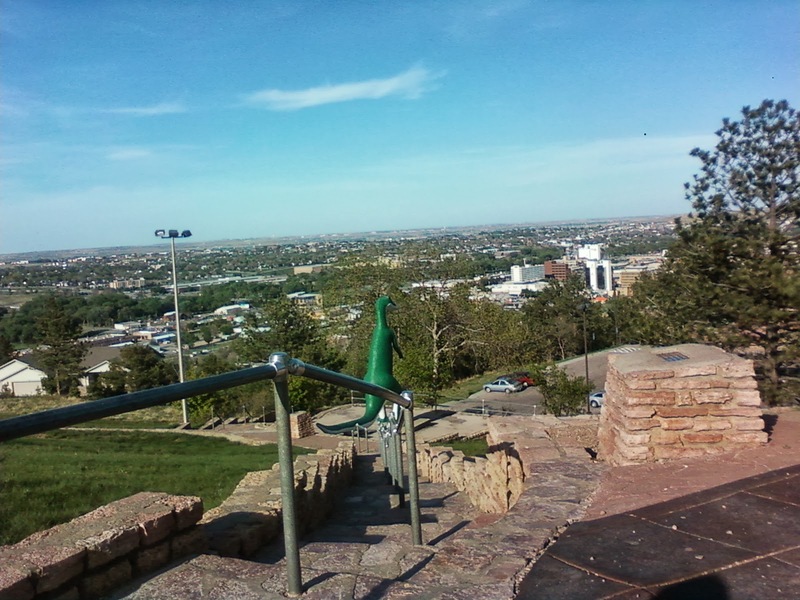 This park was free and on a HUGE hillside overlooking both sides of the city, Rapid City is split into two parts by a ridge of a mountain that offers spectacular views, especially at night. You only had to climb up 578 steps to get to the 50ft statues of dinosaurs to climb and play upon. After only being in these higher altitudes for a couple of days, I still had not acclimated to the lower oxygen levels and this climb kicked my tail. Finally I had made it to the top, just in time to witness the lil one climbing upon a triceratops’ head with the most joyful look of glee and amazement. I think they had a statue of just about every dinosaur that as kids we read about and dreamed of having one as a pet. I you had enough imagination you could easily imagine these huge statues being in your own backyard for you to climb on and slide down their tails; this was exactly what the lil one did. Soon enough it was time to climb back down the 1096 stairs, by all logic going down should have been easier than the climb; but the higher altitude wasn’t helping me any. We went into the ice cream/gift shop next, me being me; ya’ll know I was looking for the clearance table first. They had everything you would typically see in a tourist trap; the t-shirts, hats and stuffed animals, the rack of science projects that are marked up twice what you’d pay for them at any other store away from the historical sight it was tied to. We ended up talking the lil one into getting the only thing we have room for, another squished penny stamped with the sight we were visiting; I really have to remember to get us a book to store these in as we are getting quiet the collection going. Next on our list was to explore downtown Rapid City, Main Street to be exact. I love strolling through these old historical towns that are still just as they were when they were born, except all the motorized vehicles and paved roads of course. The lil one is learning a love of history by these trips too. Our only issue here is that the days of old in the lil one’s eyes are the days before remote controls and cordless phones, to think in the ‘old days’ we had to be tied to the wall and change the channels by getting up and pushing buttons. Only minutes later and we were parked and walking down Main Street, enjoying all of the life size bronze statues on just about every street corner. After the first few blocks we had decided we would walk all the way down on one side of the street and then cross to see the ones on the other side, sounded like a solid plan with logic behind it. What I didn’t count on was the blocks upon blocks of walking we had to do in this climate that I had yet to get used to. I slowly clambered along behind the two really energetic excited people that I call family. A few blocks later we found ourselves enjoying the mist from the fountain at Main Street Square. Prairie Edge Trading Co. & Galleries quickly grabbed our attention, not to mention it was right across the street so we didn’t have far to walk. This store was filled with just about anything you can imagine in a store in the Wild West. 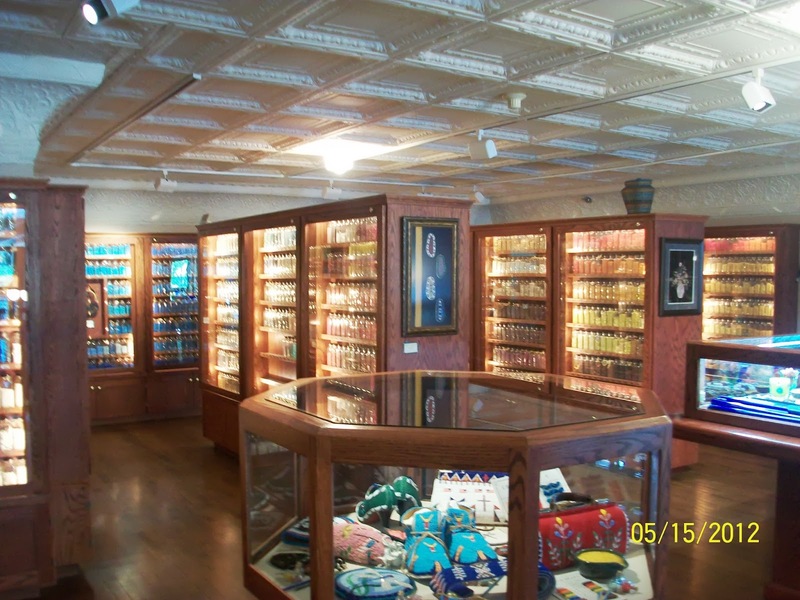 There were books, music, authentic crafts from the locals, and the finest collection of Native American art; and beads upon beads upon beads, of every size and color of the rainbow. I started looking at the art works and the prices on them and started to really believe that I could be that good to get that price with my own. On the other end of this particular block there was an alley, known as Art Alley. 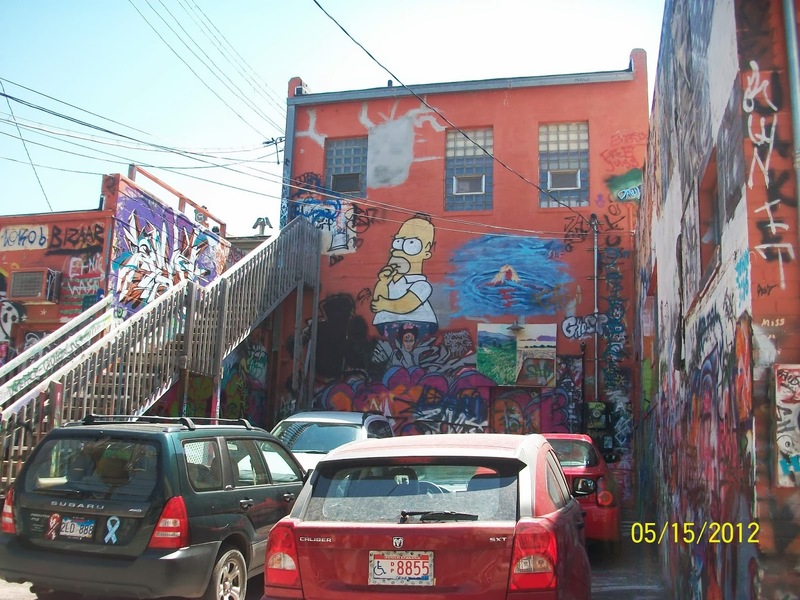 This is the one spot in town that the local graffiti artists could come and not get arrested. 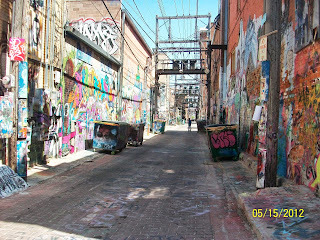 When I turned the corner and the alleyway opened up in front of us it was like walking into a rainbow of colors. 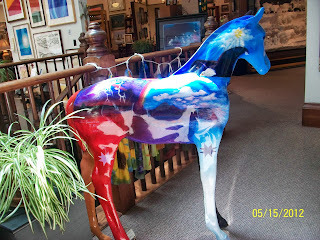 This is definitely a must see if you are an artist and find yourself in the center of Rapid City, SD. I wanted to go buy a few cans of spray paint just so the lil one and I could add our own touches to this magnificent piece of art that stretched the whole city block. One of the locals suggested a hole in the wall ice cream parlor not far from us, ‘not far from us’ sounded like it was close enough to walk to. After the first 5 or 6 blocks we referenced the map again and this was our moment we realized that ‘not far from us’ was actually about 11 very long blocks, we weren’t even halfway there yet. At this point the smart person would probably get their car and drive; but not us, we toughed it out and walked. After the hot sun beating down on us for all of these blocks we had trudged down the cold ice cream hit the spot. This was a very short lived mirage when reality hit me; we had to walk back all those long city blocks to the truck. We were absolutely exhausted by the time we pulled back into the RV Park, but we were already looking forward to the new adventures that awaited us the very next day.